What is a “lien release” or “lien waiver” and should I sign one? If you are in the construction industry in New York then chances are that at some point in time you have either asked for a “lien release” or “lien waiver” or been asked to sign one of these documents. But do you take the time to actually read the lien release/waiver to see what it is? If not, you should – all releases and waivers are not created equally. A lien release or lien waiver usually comes up when it is time to make payment on a construction project. Whether you are an owner paying a general contractor or a general contractor paying a subcontractor or supplier, lien releases and lien waivers are key to the payment process. A “lien release” or “lien waiver” essentially says that the contractor or supplier has been paid for his, her or its services and waives the right to file a mechanic’s lien against the property or project. Because of the consequences of signing a lien waiver or a lien release, you should make sure that you do it right and that you understand the difference between the types of lien releases. 1. Does the lien waiver/release refer to the correct project? 2. Is the time period referenced in the lien waiver/release the period for which you are receiving payment and waiving your right to file a mechanic’s lien? 3. 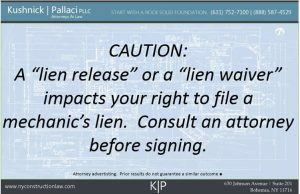 Is the release/waiver a partial lien waiver or a final lien waiver? 4. Is the amount set forth in the lien waiver/release the correct amount that you have been paid? 5. Are the names of the parties in the lien waiver/release correct? A final lien waiver or final lien release means that you have been paid in full and are forever waiving any right to file a mechanic’s lien against the project and property. The final lien waiver/release should be signed at the end of the project in connection with your final payment. A partial lien waiver or partial lien release means that you have received a partial payment, or are receiving a partial payment, and that you waive the right to file a mechanic’s lien for that particular portion of the labor or materials that you provided as identified in the lien waiver/release. Determining whether the lien release/waiver that you are signing is a final or partial lien waiver/release can sometimes be difficult. Often the document will have a title as either “Partial Lien Waiver” or “Final Lien Waiver” but, even if it does, read it. Regardless of the title, make sure that the document actually says that you are doing what you think you are doing. If it is final, that is what the release should say. If it is partial, it should say that. An important tip, which seems self evident, is to make sure that you actually are paid before you sign the release. In almost all instances the lien release or the lien waiver says that you are acknowledging receipt of payment and are waiving your right to file a mechanic’s lien. If you have not been paid and the release is not conditional then don’t sign it! Now, of course there are situations where payment will not be released until you sign and provide the lien waiver. A simultaneous exchange is acceptable. You hand the lien waiver to the person that is paying you and they in turn hand you a check. Simple enough. If you are not paid first, or simultaneously with the exchange of the lien waiver, you should try to sign a document known as a “conditional” lien waiver or a “conditional” lien release. The conditional lien waiver/release includes language that limits the effectiveness of the waiver to the extent of payment actually received. If you are offering a conditional lien waiver expect a fight from the general contractor and/or the project owner. Owners and general contractors don’t like conditional releases and waivers. More importantly, banks often don’t like them. So if your project is financed through a construction loan it is possible that the conditional waiver/release will not be accepted because disbursements under the construction loan will not be made until unconditional lien waivers are received. One final note, remember that in New York, a pre-lien waiver is void against public policy. That means that when you start the project nobody can require you to waive your right to file a mechanic’s lien before you actually provide the labor and materials. If they do, the waiver is void and is not enforceable. That does not mean you should sign the pre-lien waiver anyway. Explain that the lien waiver/release is void and that you will not waive your right to file a mechanic’s lien until you are paid for your services. Knowing your legal rights is a critical component to the contract negotiation phase. Even though lien releases and lien waivers are common in the construction industry, they are still important legal documents. As with any legal documents, we strongly suggest that you consult with legal counsel before signing a mechanic’s lien waiver or a mechanic’s lien release. Often it only takes a few minutes for an experienced construction attorney to review the waiver, make any necessary changes and get it back to you. The small cost for the review can save you a lot of time and money down the line. 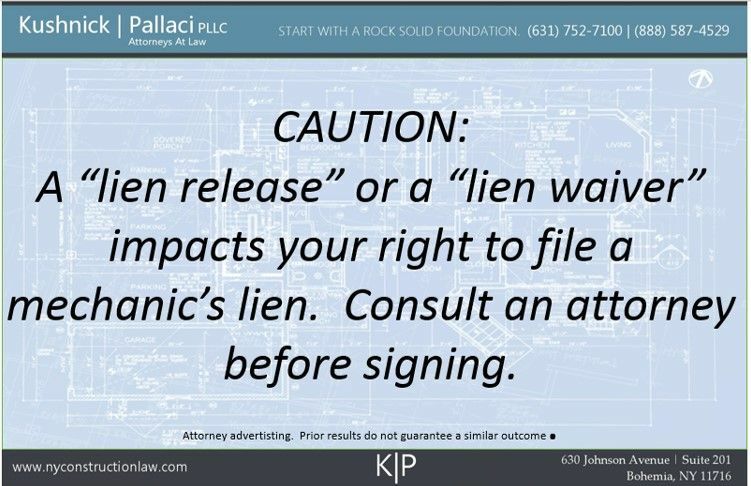 The experienced construction attorneys at Kushnick Pallaci often review and prepare lien releases and lien waivers to protect their clients’ interests. Contract us here to discuss your next lien waiver or lien release. This entry was posted in Mechanic's Liens, Public Improvement Lien and tagged Lien Release, Lien Waiver, Liens, Public Improvement Liens by VTP. Bookmark the permalink.